Ammonia, i.e. NH3, is a colorless gas with a strong smell. Its serves as a precursor in the production of fertilizer, but we also know it as a cleaning product, ammonium hydroxide, which is NH3 dissolved in water. It has a lot of other uses too. For example, its use in this post, is to illustrate a two-state system. 🙂 We’ll apply everything we learned in our previous posts and, as I mentioned when finishing the last of those rather mathematical pieces, I think the example really feels like a reward after all of the tough work on all of those abstract concepts – like that Hamiltonian matrix indeed – so I hope you enjoy it. So… Here we go! Here, we will only worry about the spin of the molecule about its axis of symmetry, as shown above, which is either in one direction or in the other, obviously. So we’ll discuss the molecule as a two-state system. So we don’t care about its translational (i.e. linear) momentum, its internal vibrations, or whatever else that might be going on. It is one of those situations illustrating that the spin vector, i.e. the vector representing angular momentum, is an axial vector: the first state, which is denoted by | 1 〉 is not the mirror image of state | 2 〉. In fact, there is a more sophisticated version of the illustration above, which usefully reminds us of the physics involved. It should be noted, however, that we don’t need to specify what the energy barrier really consists of: moving the center of mass obviously requires some energy, but it is likely that a ‘flip’ also involves overcoming some electrostatic forces, as shown by the reversal of the electric dipole moment in the illustration above. In fact, the illustration may confuse you, because we’re usually thinking about some net electric charge that’s spinning, and so the angular momentum results in a magnetic dipole moment, that’s either ‘up’ or ‘down’, and it’s usually also denoted by the very same μ symbol that’s used below. As I explained in my post on angular momentum and the magnetic moment, it’s related to the angular momentum J through the so-called g-number. In the illustration above, however, the μ symbol is used to denote an electric dipole moment, so that’s different. Don’t rack your brain over it: just accept there’s an energy barrier, and it requires energy to get through it. Don’t worry about its details! You may – in fact, you should – mechanically apply that | = ∑ | i 〉〈 i | substitution to | ψ 〉 to get what you get here, but you should also think about what you’re writing. It’s not an easy thing to interpret, but it may help you to think of the similarity of the formula above with the description of a vector in terms of its base vectors, which we write as A = Ax·e1 + Ay·e2 + Az·e3. Just substitute the Ai coefficients for Ci and the ei base vectors for the | i 〉 base states, and you may understand this formula somewhat better. It also explains why the | ψ 〉 state is often referred to as the | ψ 〉 state vector: unlike our A = ∑ Ai·ei sum of base vectors, our | 1 〉 C1 + | 2 〉 C2 sum does not have any geometrical interpretation but… Well… Not all ‘vectors’ in math have a geometric interpretation, and so this is a case in point. Why this time dependency? It’s because we’ll allow for the possibility of the nitrogen to push its way through the pyramid – through the three hydrogens, really – and flip to the other side. It’s unlikely, because it requires a lot of energy to get half-way through (we’ve got what we referred to as an energy barrier here), but it may happen and, as we’ll see shortly, it results in us having to think of the the ammonia molecule as having two separate energy levels, rather than just one. We’ll denote those energy levels as E0 ± A. However, I am getting ahead of myself here, so let me get back to the main story. Two equations and two functions – C1 = C1(t) and C2 = C2(t) – so we should be able to solve this thing, right? Well… No. We don’t know those Hij coefficients. As I explained in my previous post, they also evolve in time, so we should write them as Hij(t) instead of Hij tout court, and so it messes the whole thing up. We have two equations and six functions really. There is no way we can solve this! So how do we get out of this mess? C2 = a·e−(i/ħ)·(H22·t) = a·e−(i/ħ)·(E2·t), with H22 = E2. But can we interpret C1 and C2 as proper amplitudes? They are just coefficients in these equations, aren’t they? Well… Yes and no. From what we wrote in previous posts, you should remember that these Ci coefficients are equal to 〈 i | ψ 〉, so they are the amplitude to find our ammonia molecule in one state or the other. Now, the probabilities have to add up to 1, so a2 + a2 = 1 and, therefore, the probability to be in either in state 1 or state 2 is 0.5, which is what we’d expect. Unsurprisingly, we find the same thing: these probabilities have to add up to 1, so a2 + a2 = 1 and, therefore, the probability to be in state 1 or state 2 is 0.5. So the notation and the logic behind makes perfect sense. But let me get back to the lesson now. You should note that these non-varying probabilities are related to the fact that the amplitudes have a non-varying magnitude. The phase of these amplitudes varies in time, of course, but their magnitude is and remains a, always. The amplitude is not being ‘enveloped’ by another curve, so to speak. OK. That should be clear enough. Sorry I spent so much time on this, but this stuff on ‘stationary’ states comes back again and again and so I just wanted to clear that up as much as I can. Let’s get back to the story. So we get two stationary states now. Why two instead of one? Well… You need to use your imagination a bit here. They actually reflect each other: they’re the same as the one stationary state we found when assuming our nitrogen atom could not ‘flip’ from one position to the other. It’s just that the introduction of that possibility now results in a sort of ‘doublet’ of energy levels. But so we shouldn’t waste our time on this, as we want to analyze the general case, for which the probabilities to be in state 1 or state 2 do vary in time. So that’s when a and b are non-zero. respectively (note that the absolute square of i is equal to 1, not −1). The graph of these functions is depicted below. As Feynman puts it: “The probability sloshes back and forth.” Indeed, the way to think about this is that, if our ammonia molecule is in state 1, then it will not stay in that state. In fact, one can be sure the nitrogen atom is going to flip at some point in time, with the probabilities being defined by that fluctuating probability density function above. Indeed, as time goes by, the probability to be in state 2 increases, until it will effectively be in state 2. And then the cycle reverses. Our | ψ 〉 = | 1 〉 C1 + | 2 〉 C2 equation is a lot more interesting now, as we do have a proper mix of pure states now: we never really know in what state our molecule will be, as we have these ‘oscillating’ probabilities now, which we should interpret carefully. The point to note is that the a = 0 and b = 0 solutions came with precise temporal frequencies: (E0 − A)/ħ and (E0 + A)/ħ respectively, which correspond to two separate energy levels: E0 − A and E0 + A respectively, with |A| = H12 = H21. So everything is related to everything once again: allowing the nitrogen atom to push its way through the three hydrogens, so as to flip to the other side, thereby breaking the energy barrier, is equivalent to associating two energy levels to the ammonia molecule as a whole, thereby introducing some uncertainty, or indefiniteness as to its energy, and that, in turn, gives us the amplitudes and probabilities that we’ve just calculated. Note that the probabilities “sloshing back and forth”, or “dumping into each other” – as Feynman puts it – is the result of the varying magnitudes of our amplitudes, going up and down and, therefore, their absolute square varies too. Now, writing things this way, rather than in terms of probabilities, makes it clear that the two base states of the molecule themselves are associated with two different energy levels, so it is not like one state has more energy than the other. It’s just that the possibility of going from one state to the other requires an uncertainty about the energy, which is reflected by the energy doublet E0 ± A in the wavefunction of the base states. Now, if the wavefunction of the base states incorporates that energy doublet, then it is obvious that the state of the ammonia molecule, at any point in time, will also incorporate that energy doublet. This triggers the following remark: what’s the uncertainty really? Is it an uncertainty in the energy, or is it an uncertainty in the wavefunction? I mean: we have a function relating the energy to a frequency. Introducing some uncertainty about the energy is mathematically equivalent to introducing uncertainty about the frequency. Think of it: two energy levels implies two frequencies, and vice versa. More in general, introducing n energy levels, or some continuous range of energy levels ΔE, amounts to saying that our wave function doesn’t have a specific frequency: it now has n frequencies, or a range of frequencies Δω = ΔE/ħ. Of course, the answer is: the uncertainty is in both, so it’s in the frequency and in the energy and both are related through the wavefunction. So… In a way, we’re chasing our own tail. Having said that, the energy may be uncertain, but it is real. It’s there, as evidenced by the fact that the ammonia molecule behaves like an atomic oscillator: we can excite it in exactly the same way as we can excite an electron inside an atom, i.e. by shining light on it. The only difference is the photon energies: to cause a transition in an atom, we use photons in the optical or ultraviolet range, and they give us the same radiation back. To cause a transition in an ammonia molecule, we only need photons with energies in the microwave range. Here, I should quickly remind you of the frequencies and energies involved. visible light is radiation in the 400–800 terahertz range and, using the E = h·f equation, we can calculate the associated energies of a photon as 1.6 to 3.2 eV. Microwave radiation – as produced in your microwave oven – is typically in the range of 1 to 2.5 gigahertz, and the associated photon energy is 4 to 10 millionths of an eV. Having illustrated the difference in terms of the energies involved, I should add that masers and lasers are based on the same physical principle: LASER and MASER stand for Light/Micro-wave Amplification by Stimulated Emission of Radiation, respectively. However, the answer is: it really doesn’t matter. One could write: H12 and H21 = +A, and we’d find the same equations. We’d just switch the indices 1 and 2, and the coefficients a and b. But we get the same solutions. You can figure that out yourself. Have fun with it ! What I want to do here is show how we can get from those equations to some kind of wave equation: an equation that describes how a field actually travels through space. So… Well… Let’s first look at that very particular wave function we used in the previous post to prove that electromagnetic waves propagate with speed c, i.e. the speed of light. The fields were very simple: the electric field had a y-component only, and the magnetic field a z-component only. Their magnitudes, i.e. their magnitude where the field had reached, as it fills the space traveling outwards, were given in terms of J, i.e. the surface current density going in the positive y-direction, and the geometry of the situation is illustrated below. This idea of using the retarded time t’ = t − x/c in the argument of a wave function f – or, what amounts to the same, using x − c/t – is key to understanding wave functions. I’ve explained this in very simple language in a post for my kids and, if you don’t get this, I recommend you check it out. What we’re doing, basically, is converting something expressed in time units into something expressed in distance units, or vice versa, using the velocity of the wave as the scale factor, so time and distance are both expressed in the same unit, which may be seconds, or meter. Here, I need to add something about the direction of travel. The pulse above travel in the positive x-direction, so that’s why we have x minus ct in the argument. For a wave traveling in the negative x-direction, we’ll have a wave function y = F(x+ct). In any case, I can’t dwell on this, so let me move on. Now, our wave does not vary in the y and z direction, so none of the components, including Ey and Ez depend on y or z. It only varies in the x-direction, so ∂Ey/∂y and ∂Ez/∂z are zero. Note that the cross-derivatives ∂Ey/∂z and ∂Ez/∂y are also zero: we’re talking a plane wave here, the field varies only with x. However, because ∇·E = 0, ∂Ex/∂x must be zero and, hence, Ex must be zero. Huh? What? How is that possible? You just said that our field does vary in the x-direction! And now you’re saying it doesn’t it? Read carefully. I know it’s complicated business, but it all makes sense. Look at the function: we’re talking Ey, not Ex. Ey does vary as a function of x, but our field does not have an x-component, so Ex = 0. We have no cross-derivative ∂Ey/∂x in the divergence of E (i.e. in ∇·E = 0). Huh? What? Let me put it differently. E has three components: Ex, Ey and Ez, and we have three space coordinates: x, y and z, so we have nine cross-derivatives. What I am saying is that all derivatives with respect to y and z are zero. That still leaves us with three derivatives: ∂Ex/∂x, ∂Ey/∂x, and ∂Ey/∂x. So… Because all derivatives in respect to y and z are zero, and because of the ∇·E = 0 equation, we know that ∂Ex/∂x must be zero. So, to make a long story short, I did not say anything about ∂Ey/∂x or ∂Ez/∂x. These may still be whatever they want to be, and they may vary in more or in less complicated ways. I’ll give an example of that in a moment. Having said that, I do agree that I was a bit quick in writing that, because ∂Ex/∂x = 0, Ex must be zero too. Looking at the math only, Ex is not necessarily zero: it might be some non-zero constant. So… Yes. That’s a mathematical possibility. The static field from some charged condenser plate would be an example of a constant Ex field. However, the point is that we’re not looking at such static fields here: we’re talking dynamics here, and we’re looking at a particular type of wave: we’re talking a so-called plane wave. Now, the wave front of a plane wave is… Well… A plane. 🙂 So Ex is zero indeed. It’s a general result for plane waves: the electric field of a plane wave will always be at right angles to the direction of propagation. OK. I should really stop now. But… Well… Now that we’ve got a general solution for all plane waves, why not be even bolder and think about what we could possibly say about three-dimensional waves? So then Ex and, therefore, Bx would not necessarily be zero either. After all, light can behave that way. In fact, light is likely to be non-polarized and, hence, Ex and, therefore, Bx are most probably not equal to zero! “Try to imagine what the electric and magnetic fields look like at present in the space in this lecture room. First of all, there is a steady magnetic field; it comes from the currents in the interior of the earth—that is, the earth’s steady magnetic field. Then there are some irregular, nearly static electric fields produced perhaps by electric charges generated by friction as various people move about in their chairs and rub their coat sleeves against the chair arms. Then there are other magnetic fields produced by oscillating currents in the electrical wiring—fields which vary at a frequency of 6060 cycles per second, in synchronism with the generator at Boulder Dam. But more interesting are the electric and magnetic fields varying at much higher frequencies. For instance, as light travels from window to floor and wall to wall, there are little wiggles of the electric and magnetic fields moving along at 186,000 miles per second. Then there are also infrared waves travelling from the warm foreheads to the cold blackboard. And we have forgotten the ultraviolet light, the x-rays, and the radiowaves travelling through the room. Flying across the room are electromagnetic waves which carry music of a jazz band. There are waves modulated by a series of impulses representing pictures of events going on in other parts of the world, or of imaginary aspirins dissolving in imaginary stomachs. To demonstrate the reality of these waves it is only necessary to turn on electronic equipment that converts these waves into pictures and sounds. If we go into further detail to analyze even the smallest wiggles, there are tiny electromagnetic waves that have come into the room from enormous distances. There are now tiny oscillations of the electric field, whose crests are separated by a distance of one foot, that have come from millions of miles away, transmitted to the earth from the Mariner II space craft which has just passed Venus. Its signals carry summaries of information it has picked up about the planets (information obtained from electromagnetic waves that travelled from the planet to the space craft). There are very tiny wiggles of the electric and magnetic fields that are waves which originated billions of light years away—from galaxies in the remotest corners of the universe. That this is true has been found by “filling the room with wires”—by building antennas as large as this room. Such radiowaves have been detected from places in space beyond the range of the greatest optical telescopes. Even they, the optical telescopes, are simply gatherers of electromagnetic waves. What we call the stars are only inferences, inferences drawn from the only physical reality we have yet gotten from them—from a careful study of the unendingly complex undulations of the electric and magnetic fields reaching us on earth. When wrapping up my previous post, I said that I might be tempted to write something about how to solve these differential equations. The math behind them is pretty essential indeed. So let’s revisit the oscillator from a formal-mathematical point of view. The simplest equation we used was the one for a hypothetical ‘ideal’ oscillator without friction and without any external driving force. The equation for a mechanical oscillator (i.e. a mass on a spring) is md2x/dt2 = –kx. The k in this equation is a factor of proportionality: the force pulling back is assumed to be proportional to the amount of stretch, and the minus sign is there because the force is pulling back indeed. As for the equation itself, it’s just Newton’s Law: the mass times the acceleration equals the force: ma = F.
You’ll remember we preferred to write this as d2x/dt2 = –(k/m)x = –ω02x with ω02 = k/m. You’ll also remember that ω0 is an angular frequency, which we referred to as the natural frequency of the oscillator (because it determines the natural motion of the spring indeed). We also gave the general solution to the differential equation: x(t) = x0cos(ω0t + Δ). That solution basically states that, if we just let go of that spring, it will oscillate with frequency ω0 and some (maximum) amplitude x0, the value of which depends on the initial conditions. As for the Δ term, that’s just a phase shift depending on where x is when we start counting time: if x would happen to pass through the equilibrium point at time t = 0, then Δ would be π/2. So Δ allows us to shift the beginning of time, so to speak. In my previous posts, I just presented that general equation as a fait accompli, noting that a cosine (or sine) function does indeed have that ‘nice’ property of come back to itself with a minus sign in front after taking the derivative two times: d2[cos(ω0t)]/dt2 = –ω02cos(ω0t). 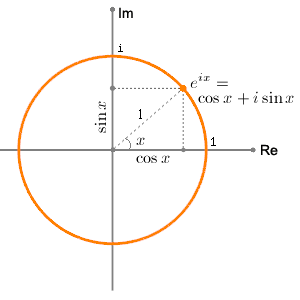 We could also write x(t) as a sine function because the sine and cosine function are basically the same except for a phase shift: x0cos(ω0t + Δ) = x0sin(ω0t + Δ + π/2). Sinusoidal functions are periodic functions and so that’s why they represent an oscillation–because that’s something periodic too! Sinusoidal functions come back to themselves when we derive them two times and so that’s why it effectively solves our second-order differential equation. However, in my previous post, I also mentioned in passing that sinusoidal functions share that second property with exponential functions: d2et/dt2 = d[det/dt]/dt = det/dt = et. So, if it we would not have had that minus sign in our differential equation, our solution would have been some exponential function, instead of a sine or a cosine function. So what’s going on here? Let’s scrap that minus sign and assume our problem would indeed be to solve the d2x/dt2 = ω02x equation. 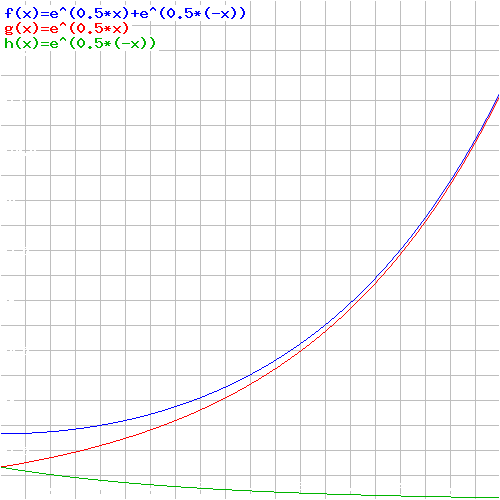 So we know we should use some exponential function, but we have that coefficient ω02. Well… That’s actually easy to deal with: we know that, when deriving an exponential function, we should bring the exponent down as a coefficient: d[eω0t]/dt = ω0eω0t. If we do it two times, we get d2[eω0t]/dt2 = ω02eω0t, so we can immediately see that eω0t is a solution indeed. But it’s not the only one: e–ω0t is a solution too: d2[e–ω0t]/dt2 = (–ω0)(–ω0)e–ω0t = ω02e–ω0t. So e–ω0t solves the equation too. It is easy to see why: ω02 has two square roots–one positive, and one negative. But we have more: in fact, every linear combination c1eω0t + c2e–ω0t is also a solution to that second-order differential equation. Just check it by writing it all out: you’ll find that d2[c1eω0t + c2e–ω0t]/dt2 = ω02[c1eω0t +c2e–ω0t] and so, yes, we have a whole family of functions here, that are all solutions to our differential equation. Now, you may or may not remember that we had the same thing with first-order differential equations: we would find a whole family of functions, but only one would be the actual solution or the ‘real‘ solution I should say. So what’s the real solution here? If we have a linear second-order differential equation ax” + bx’ + cx = 0 (because of the zero on the right-hand side, we call such equation homogeneous, so it’s quite a mouthful: a linear and homogeneous DE of the second order), then we can find an exponential function ert that will be a solution for it. If such function is a solution, then plugging in it yields ar2ert + brert + cert = 0 or (ar2 + br + c)ert = 0. Note that the general solution is based on the principle of superposition: any linear combination of two specific solutions will be a solution as well. I am mentioning this here because we’ll use that principle more than once. The steps as described above implicitly assume that the quadratic equation above (i.e. ar2ert + brert + cert = 0), which is better known as the characteristic equation, does yield two real and distinct roots r1 and r2. In fact, it amounts to assuming that that exponential ert is a real-valued exponential function. We know how to find these real roots from our high school math classes: r = (–b ± [b2 – 4ac]1/2)/2a. However, what happens if the discrimant b2 – 4ac is negative? Also, the general solution based on these two particular solutions will be c1e(α+βi)t + c2e(α–βi)t.
We should briefly pause here to think about what we are doing here really: if we allow r to be complex, then what we’re doing really is allow a complex-valued function (to be precise: we’re talking the complex exponential functions e(λ±μi)t, or any linear combination of the two) of a real variable (the time variable t) to be part of our ‘solution set’ as well. 1. The first factor (i.e. eαt) is just a real-valued exponential function and so we should be familiar with that. 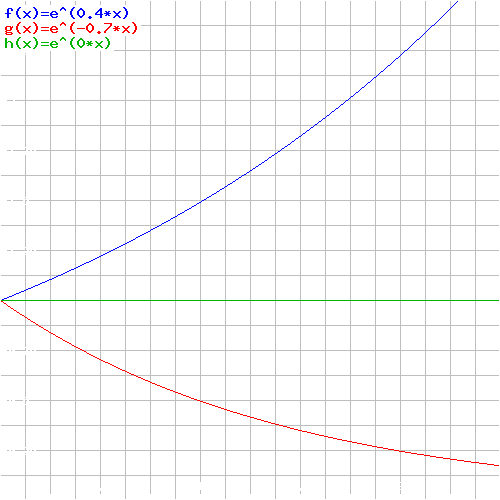 Depending on the value of α (negative or positive: see the graph below), it’s a factor that will create an envelope for our function. Indeed, when α is negative, the damping will cause the oscillation to stop after a while. When α is positive, we’ll have a solution resembling the second graph below: we have an amplitude that’s getting bigger and bigger, despite the friction factor (that’s obviously possible only because we keep reinforcing the movement, so we’re not switching off the force in that case). When α is equal to zero, then eαt is equal to unity and so the amplitude will not change as the spring goes up and down over time: we have no friction in that case. The two graphs below represent the idea: as the phase θ = ωt + Δ (the angular frequency or velocity times the time is equal to the phase, plus or minus some phase shift) goes round and round and round (i.e. increases with time), the two components of eiθ, i.e. 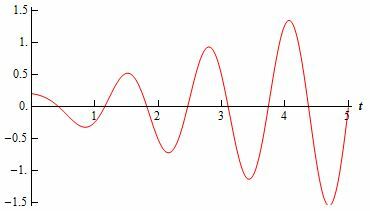 the real and imaginary part eiθ, oscillate between –1 and 1 because they are both sinusoidal functions (cosine and sine respectively). Now, we could amplify the amplitude by putting another (real) factor in front (a magnitude different than 1) and write reiθ = r·cos(θ) + i·r·sin(θ) but that wouldn’t change the nature of this thing. But so how does all of this relate to that other ‘general’ solution which we’ve found for our oscillator, i.e. the one we got without considering these complex-valued exponential functions as solutions. Indeed, what’s the relation between that x = x0cos(ω0t + Δ) equation and that rather frightening c1e(α+βi)t + c2e(α–βi)t equation? Perhaps we should look at x = x0cos(ω0t + Δ) as the real part of that monster? Yes and no. More no than yes actually. Actually… No. We are not going to have some complex exponential and then forget about the imaginary part. What we will do, though, is to find that general solution – i.e. a family of complex-valued functions – but then we’ll only consider those functions for which the imaginary part is zero, so that’s the subset of real-valued functions only. I guess this must sound like Chinese. Let’s go step by step. If we re-write d2x/dt2 = –ω02x in the more general ax” + bx’ + cx = 0 form, then we get x” + ω02x = 0 and so the discriminant b2 – 4ac is equal to –4ω02, and so that’s a negative number. So we need to go for these complex roots. However, before solving this, let’s first restate what we’re actually doing. We have a differential equation that, ultimately, depends on a real variable (the time variable t), but so now we allow complex-valued functions er1t = e(α+βi)t and er2t = e(α–βi)t as solutions. To be precise: these are complex-valued functions x of the real variable t.
That being said, it’s fine to note that real numbers are a subset of the complex numbers and so we can just shrug our shoulders and say all that we’re doing is switch to complex-valued functions because we got stuck with that negative determinant and so we had to allow for complex roots. However, in the end, we do want a real-valued solution x(t). So our x(t) = c1e(α+βi)t + c2e(α–βi)t has to be a real-valued function, not a complex-valued function. That means that we have to take a subset of the family of functions that we’ve found. In other words, the imaginary part of c1e(α+βi)t + c2e(α–βi)t has to be zero. How can it be zero? Well… It basically means that c1e(α+βi)t and c2e(α–βi)t have to be complex conjugates. Note that, for the e(α–βi)t expression, we’ve used the fact that cos(–θ) = cos(θ) and that sin(–θ) = –sin(θ). Also note that α and β are real numbers, so they do not have an imaginary part–unlike c1 and c2, which may or may not have an imaginary part (i.e. they could be pure real numbers, but they could be complex as well). So, while c1 and c2 are complex, our grand result is a real-valued function once again or – to be precise – another family of real-valued functions (that’s because c can take on any value). So what do we have here? Well, the first factor is, once again, an ‘envelope’ function: depending on the value of α, (i) negative, (ii) positive or (iii) zero, we have an oscillation that (i) damps out, (ii) goes out of control, or (iii) keeps oscillating in the same steady way forever. Are you convinced now? If not… Well… Nothing much I can do, I feel. In that case, I can only encourage you to do a full ‘work-out’ by reading the excellent overview of all possible situations in Paul’s Online MathNotes (tutorial.math.lamar.edu/Classes/DE/Vibrations.aspx). You’ll remember this differential equation from the previous post: we used it to calculate the (stored) energy and the Q of a mechanical oscillator. However, we didn’t show you how. You now understand why: the stuff above is not easy–the length of the arguments involved is why I am devoting an entire post to it! Now, instead of assuming some exponential ert as a solution, real- or complex-valued, Feynman assumes a much more general complex-valued function as solution: he substitutes x for x = Aeiαt, with A a complex number as well so we can write A as A = A0eiΔ. That more general assumption allows for the inclusion of a phase shift straight from the start. Indeed, we can write x as x = A0eiΔeiαt = = A0ei(αt+Δ). Does that look complicated? It probably does, because we also have to remember that α is a complex number! 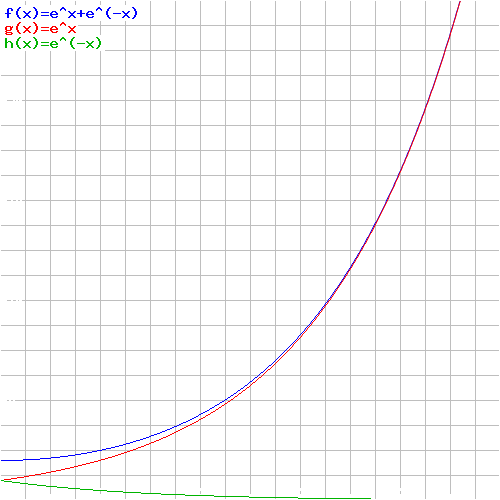 So we’ve got a very general complex-valued exponential function indeed here! So the difference between Feynman’s approach and the one I presented above (which is the one you’ll find in most textbooks) is the assumption in terms of the specific solution: instead of substituting x for ert, with allowing r to take on complex values, Feynman substitutes x for Aeiαt, and allows both A and α to take on complex values. It makes the calculations more complicated but, when everything is said and done, I think Feynman’s approach is more consistent because more encompassing. However, that’s subject to taste, and I gather, from comments on the Web, that many people think that this chapter in Feynman’s Lectures is not his best. So… Well… I’ll leave it to you to make the final judgment. I guess the only thing that I should do now is to work some examples. However, I’ll refer you Paul’s Online Math Notes for that once again (see the reference above). Indeed, it is about time I end my rather lengthy exposé (three posts on the same topic!) on oscillators and resonance. I hope you enjoyed it, although I can readily imagine that it’s hard to appreciate the math involved. It is not easy indeed: I actually struggled with it, despite the fact that I think I understand complex analysis somewhat. However, the good thing is that, once we’re through it, we can really solve a lot of problems. As Feynman notes: “Linear (differential) equations are so important that perhaps fifty percent of the time we are solving linear equations in physics and engineering.” So, bearing in that mind, we should move on to the next. The title above refers to a previous post: An Easy Piece: Introducing the wave function. Indeed, I may have been sloppy here and there – I hope not – and so that’s why it’s probably good to clarify that the wave function (usually represented as Ψ – the psi function) and the wave equation (Schrödinger’s equation, for example – but there are other types of wave equations as well) are two related but different concepts: wave equations are differential equations, and wave functions are their solutions. Indeed, from a mathematical point of view, a differential equation (such as a wave equation) relates a function (such as a wave function) with its derivatives, and its solution is that function or – more generally – the set (or family) of functions that satisfies this equation. The function can be real-valued or complex-valued, and it can be a function involving only one variable (such as y = y(x), for example) or more (such as u = u(x, t) for example). In the first case, it’s a so-called ordinary differential equation. In the second case, the equation is referred to as a partial differential equation, even if there’s nothing ‘partial’ about it: it’s as ‘complete’ as an ordinary differential equation (the name just refers to the presence of partial derivatives in the equation). Hence, in an ordinary differential equation, we will have terms involving dy/dx and/or d2y/dx2, i.e. the first and second derivative of y respectively (and/or higher-order derivatives, depending on the degree of the differential equation), while in partial differential equations, we will see terms involving ∂u/∂t and/or ∂u2/∂x2 (and/or higher-order partial derivatives), with ∂ replacing d as a symbol for the derivative. The independent variables could also be complex-valued but, in physics, they will usually be real variables (or scalars as real numbers are also being referred to – as opposed to vectors, which are nothing but two-, three- or more-dimensional numbers really). In physics, the independent variables will usually be x – or let’s use r = (x, y, z) for a change, i.e. the three-dimensional space vector – and the time variable t. An example is that wave function which we introduced in our ‘easy piece’. That sounds a bit more complicated, perhaps, but it means the same: once you have a good mathematical model of a physical problem, you will often end up with a differential equation representing the system you’re looking at, and then you can do all kinds of things, such as analyzing whether or not the actual system is in an equilibrium and, if not, whether it will tend to equilibrium or, if not, what the equilibrium conditions would be. But here I’ll refer to my previous posts on the topic of differential equations, because I don’t want to get into these details – as I don’t need them here. You should note that, in physics, we apply the gradient only to the spatial variables, not to time. For the derivative in regard to time, we just write ∂u/∂t or ∂Ψ/∂t. As you can see, the gradient operator returns a vector with three components if we apply it to a real- or complex-valued function of r, and so we can do all kinds of funny things with it combining it with the scalar or vector product, or with both. Here I need to remind you that, in a vector space, we can multiply vectors using either (i) the scalar product, aka the dot product (because of the dot in its notation: a•b) or (ii) the vector product, aka as the cross product (yes, because of the cross in its notation: a×b). 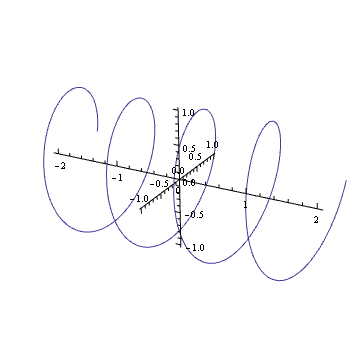 So we can define a whole range of new operators using the gradient and these two products, such as the divergence and the curl of a vector field. For example, if E is the electric field vector (I am using an italic bold-type E so you should not confuse E with the energy E, which is a scalar quantity), then div E = ∇•E, and curl E =∇×E. Taking the divergence of a vector will yield some number (so that’s a scalar), while taking the curl will yield another vector. The first equation (Gauss’ law) can be derived from the equations for Coulomb’s law and the forces acting upon a charge q in an electromagnetic field: F = q(E + v×B) – with B the magnetic field vector (F is also referred to as the Lorentz force: it’s the combined force on a charged particle caused by the electric and magnetic fields; v the velocity of the (moving) charge; ρ the charge density (so charge is thought of as being distributed in space, rather than being packed into points, and that’s OK because our scale is not the quantum-mechanical one here); and, finally, ε0 the electric constant (some 8.854×10−12 farads per meter). The second equation (Faraday’s law) gives the electric field associated with a changing magnetic field. The third equation basically states that there is no such thing as a magnetic charge: there are only electric charges. Finally, in the last equation, we have a vector j representing the current density: indeed, remember than magnetism only appears when (electric) charges are moving, so if there’s an electric current. As for the equation itself, well… That’s a more complicated story so I will leave that for the post scriptum. We can do many more things: we can also take the curl of the gradient of some scalar, or the divergence of the curl of some vector (both have the interesting property that they are zero), and there are many more possible combinations – some of them useful, others not so useful. However, this is not the place to introduce differential calculus of vector fields (because that’s what it is). Now, you may wonder what it means to take the derivative (or partial derivative) of a complex-valued function (which is what we are doing in the case of Ψ) but don’t worry about that: a complex-valued function of one or more real variables, such as our Ψ(x, t), can be decomposed as Ψ(x, t) =ΨRe(x, t) + iΨIm(x, t), with ΨRe and ΨRe two real-valued functions representing the real and imaginary part of Ψ(x, t) respectively. In addition, the rules for integrating complex-valued functions are, to a large extent, the same as for real-valued functions. For example, if z is a complex number, then dez/dz = ez and, hence, using this and other very straightforward rules, we can indeed find the partial derivatives of a function such as Ψ(r, t) = Aei(p·r – Et)ħ with respect to all the (real-valued) variables in the argument. This Heaviside form assumes a charge-free vacuum space, so there are no external forces acting upon our electromagnetic wave. There are also no other complications such as electric currents. Also, the c2 (i.e. the square of the speed of light) is written here c2 = 1/με, with μ and ε the so-called permeability (μ) and permittivity (ε) respectively (c0, μ0 and ε0 are the values in a vacuum space: indeed, light travels slower elsewhere (e.g. in glass) – if at all). The derivation is not difficult. In fact, it’s much easier than the derivation for the Schrödinger equation which I will present in a moment. But, even if it is very short, I will just refer to Wikipedia in case you would be interested in the details (see the article on the electromagnetic wave equation). The point here is just to illustrate what is being done with these wave equations and why – not so much how. Indeed, you may wonder what we have gained with this ‘reduction’. This resembles the one I introduced when presenting the de Broglie equations, except that – this time around – we are talking a real electromagnetic wave, not some probability amplitude. Another difference is that we allow a composite wave with two components: one traveling in the positive x-direction, and one traveling in the negative x-direction. Now, if you read the post in which I introduced the de Broglie wave, you will remember that these Aei(kx–ωt) or Be–i(kx+ωt) waves give strange probabilities. However, because we are not looking at some probability amplitude here – so it’s not a de Broglie wave but a real wave (so we use complex number notation only because it’s convenient but, in practice, we’re only considering the real part), this functional form is quite OK.
Huh? Well… Yes. If you really can’t follow here, I can only refer you to my post on Fourier analysis and Fourier transforms: I cannot reproduce that one here because that would make this post totally unreadable. We have a wave packet here, and so that’s the sum of an infinite number of component waves that interfere constructively in the region of the envelope (so that’s the location of the packet) and destructively outside. The integral is just the continuum limit of a summation of n such waves. So this integral will yield a function u with x and t as independent variables… If we know A(k) that is. Now that’s the beauty of these Fourier integrals (because that’s what this integral is). As mentioned above, we are actually only interested in the real part of this equation (so that’s the e with the exponent factor (note there is no i in it, so it’s just some real number) multiplied with the cosine term). That’s it. This is the Schrödinger equation – in a somewhat simplified form but it’s OK.
[…] You’ll find that equation above either very simple or, else, very difficult depending on whether or not you understood most or nothing at all of what I wrote above it. If you understood something, then it should be fairly simple, because it hardly differs from the other wave equation. Indeed, we have that imaginary unit (i) in front of the left term, but then you should not panic over that: when everything is said and done, we are working here with the derivative (or partial derivative) of a complex-valued function, and so it should not surprise us that we have an i here and there. It’s nothing special. In fact, we had them in the equation above too, but they just weren’t explicit. The second difference with the electromagnetic wave equation is that we have a first-order derivative of time only (in the electromagnetic wave equation we had ∂2u/∂t2, so that’s a second-order derivative). Finally, we have a -1/2 factor in front of the right-hand term, instead of c2. OK, so what? It’s a different thing – but that should not surprise us: when everything is said and done, it is a different wave equation because it describes something else (not an electromagnetic wave but a quantum-mechanical system). These new operators involve matrix algebra. Fine, you’ll say. Let’s get on with it. Well… It’s matrix algebra with matrices with complex elements, so if we write a n×m matrix A as A = (aiaj), then the elements aiaj (i = 1, 2,… n and j = 1, 2,… m) will be complex numbers. That allows us to define Hermitian matrices: a Hermitian matrix is a square matrix A which is the same as the complex conjugate of its transpose. We can use such matrices as operators indeed: transformations acting on a column vector X to produce another column vector AX. Now, you’ll remember – from your course on matrix algebra with real (as opposed to complex) matrices, I hope – that we have this very particular matrix equation AX = λX which has non-trivial solutions (i.e. solutions X ≠ 0) if and only if the determinant of A-λI is equal to zero. This condition (det(A-λI) = 0) is referred to as the characteristic equation. This characteristic equation is a polynomial of degree n in λ and its roots are called eigenvalues or characteristic values of the matrix A. The non-trivial solutions X ≠ 0 corresponding to each eigenvalue are called eigenvectors or characteristic vectors. OK. You probably did not understand one iota of this but, even then, you will object that this does not resemble the equation I wrote at the very beginning: i(∂u/∂t) = (-1/2)∇2u. Now, how is the equation above related to i(∂u/∂t) = (-1/2)∇2u? It’s a very simplified version of it: potential energy is, once again, assumed to be not relevant (so we’re talking a free particle again, with no external forces acting on it) but the real simplification is that we give m and ħ the value 1, so m = ħ = 1. Why? However, because the wave equation is different, the wave packet behaves differently. It’s a so-called dispersive wave packet: it delocalizes. Its width increases over time and so, after a while, it just vanishes because it diffuses all over space. So there’s a solution to the wave equation, given this initial condition, but it’s just not stable – as a description of some particle that is (from a mathematical point of view – or even a physical point of view – there is no issue). Schrödinger’s equation is just like any other differential equation used in physics, in the sense that it represents a system subject to constraints, such as the relationship between energy and momentum. It will have many general solutions. In other words, the wave function – which describes a probability amplitude as a function in space and time – will have many general solutions, and a specific solution will depend on the initial conditions. The solution(s) can represent stationary states, but not necessary so: a wave (or a wave packet) can be non-dispersive or dispersive. However, when we plug the wave function into the wave equation, it will satisfy that equation. First, we should say something more about these two other operators which I introduced above: the divergence and the curl. First on the divergence. So if we write that ∇•E = ρ/ε0, then it means that we have some constant flux of E because of some (fixed) distribution of charges. 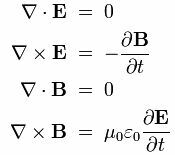 Now, we already mentioned that equation (2) in Maxwell’s set meant that there is no such thing as a ‘magnetic’ charge: indeed, ∇•B = 0 means there is no magnetic flux. But, of course, magnetic fields do exist, don’t they? They do. A current in a wire, for example, i.e. 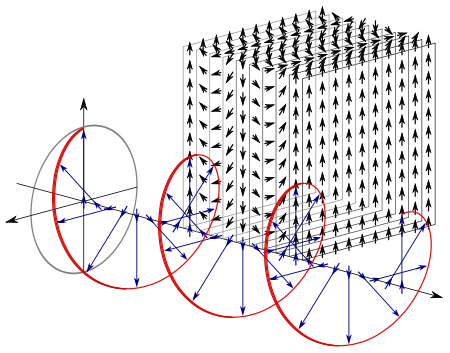 a bunch of steadily moving electric charges, will induce a magnetic field according to Ampère’s law, which is part of equation (4) in Maxwell’s set: c2∇×B = j/ε0, with j representing the current density and ε0 the electric constant. Now, at this point, we have this curl: ∇×B. Just like divergence (or convergence as Maxwell called it – but then with the sign reversed), curl also means something in physics: it’s the amount of ‘rotation’, or ‘circulation’ as Feynman calls it, around some loop. 1. The first point to note is that factor c2 in the c2∇×B = j/ε0 equation. That’s something which you don’t have in the ∇•E = ρ/ε0 equation. Of course, you’ll say: So what? Well… It’s weird. And if you bring it to the other side of the equation, it becomes clear that you need an awful lot of current for a tiny little bit of magnetic circulation (because you’re dividing by c2 , so that’s a factor 9 with 16 zeroes after it (9×1016): an awfully big number in other words). Truth be said, it reveals something very deep. Hmm? Take a wild guess. […] Relativity perhaps? Well… Yes! It’s obvious that we buried v somewhere in this equation, the velocity of the moving charges. But then it’s part of j of course: the rate at which charge flows through a unit area per second. But – Hey! – velocity as compared to what? What’s the frame of reference? The frame of reference is us obviously or – somewhat less subjective – the stationary charges determining the electric field according to equation (1) in the set above: ∇•E = ρ/ε0. But so here we can ask the same question: stationary in what reference frame? As compared to the moving charges? Hmm… But so how does it work with relativity? I won’t copy Feynman’s 13th Lecture here, but so, in that lecture, he analyzes what happens to the electric and magnetic force when we look at the scene from another coordinate system – let’s say one that moves parallel to the wire at the same speed as the moving electrons, so – because of our new reference frame – the ‘moving electrons’ now appear to have no speed at all but, of course, our stationary charges will now seem to move. What Feynman finds – and his calculations are very easy and straightforward – is that, while we will obviously insert different input values into Maxwell’s set of equations and, hence, get different values for the E and B fields, the actual physical effect – i.e. the final Lorentz force on a (charged) particle – will be the same. To be very specific, in a coordinate system at rest with respect to the wire (so we see charges move in the wire), we find a ‘magnetic’ force indeed, but in a coordinate system moving at the same speed of those charges, we will find an ‘electric’ force only. And from yet another reference frame, we will find a mixture of E and B fields. However, the physical result is the same: there is only one combined force in the end – the Lorentz force F = q(E + v×B) – and it’s always the same, regardless of the reference frame (inertial or moving at whatever speed – relativistic (i.e. close to c) or not). Note: Don’t think we’re talking astronomical speeds here when comparing the two reference frames. It would also work for astronomical speeds but, in this case, we are talking the speed of the electrons moving through a wire. Now, the so-called drift velocity of electrons – which is the one we have to use here – in a copper wire of radius 1 mm carrying a steady current of 3 Amps is only about 1 m per hour! So the relativistic effect is tiny – but still measurable ! 2. The second thing I want to note is that Maxwell’s set of equations with non-zero time derivatives for E and B clearly show that it’s changing electric and magnetic fields that sort of create each other, and it’s this that’s behind electromagnetic waves moving through space without losing energy. They just travel on and on. The math behind this is beautiful (and the animations in the related Wikipedia articles are equally beautiful – and probably easier to understand than the equations), but that’s stuff for another post. As the electric field changes, it induces a magnetic field, which then induces a new electric field, etc., allowing the wave to propagate itself through space. I should also note here that the energy is in the field and so, when electromagnetic waves, such as light, or radiowaves, travel through space, they carry their energy with them.